TerraCycle's purpose is to eliminate the idea of waste. We do this by creating national recycling systems for previously non-recyclable or hard-to-recycle waste. Anyone can sign up for these programs, called the Brigades, and start sending us waste. connects 40+ million Americans with excess food in their garden and local food pantries. Demand Organic is a campaign launched by the Rodale Institute to raise awareness about the benefits of organic food and farming and to recruit your help in advocating for an organic world. The #1 site for Grass-fed Food and Facts - it is your source for safe, healthy, natural and nutritious grass-fed beef, lamb, goats, bison, poultry, pork, dairy and other wild edibles. Certain synthetic food additives can effect the behavior, health, and ability to learn for you or your children? The Feingold Program is a test to determine if certain foods or food additives are triggering particular symptoms. The pesticide load chart for fresh veggies and fruits is free on this site. Join us every Saturday night for a taste of food freedom: 8 pm - 10 pm Eastern; 7 - 9 Central; 6 - 8 Mountain; 5 - 7 Pacific. Our unique mission is to generate credible scientific information and communicate the verifiable benefits of organic farming and products to society. Dr. Mark Hyman, MD is dedicated to identifying and addressing the root causes of chronic illness through a groundbreaking whole-systems medicine approach called Functional Medicine. Welcome to the exciting and energetic world of Health and Vitality! DirectLabs is the leader in direct access laboratory testing. We offer a wide variety of important health and wellness blood chemistry tests directly to you online at extremely discounted prices. Gerson Therapy - an alternative, non-toxic treatment for cancer and other chronic degenerative diseases. The Hippocrates Health Institute has been the preeminent leader in the field of natural and complementary health care and education since 1956. Homeopathy Works - Homeopathy works with us...not on us. Great source of health articles, optimal wellness products, and free natural health newsletter of top medical news by Dr. Joseph Mercola. Dedicated to Educating the Public about the Health Hazards of Amalgam Filling, Chronic Mercury Poisoning, Mercury Detoxification and the Relationship of Oral to Overall Health! News, research, stories on the incredible benefits of organic farming and food. "Healthy Soil, Healthy Food, Healthy People, Healthy Planet"
Supporting farmers engaged in sustainable farm stewardship and promoting consumer access to raw milk and local, nutrient-dense food. • Raw Milk - The foundation provides the following educational tools to the public free of charge - an online copy of "Raw Milk Production Handbook" and a micro dairy farm educational DVD "Chore Time". Hardcopies of these and the booklet "Safe Handling: Consumer's Guide to Fresh, Unprocessed Whole Milk" are available for purchase. A Campaign for Real Milk is a project of The Weston A. Price Foundation. Free Download of "Vaccine Ingredient Summary"
Are you interested in Essential Oils? If you follow my blog or facebook page, you've probably "heard" me talk about how much I love incorporating the use of therapeutic grade essential oils (EO) and aromatherapy into my work with animals (and humans). They are a staple in my healing "toolkit." . Contrary to what some may believe, not all essential oil brands are created equal. In fact, it is the discrepancy in quality that leads to some of the negative information about their use that we receive. 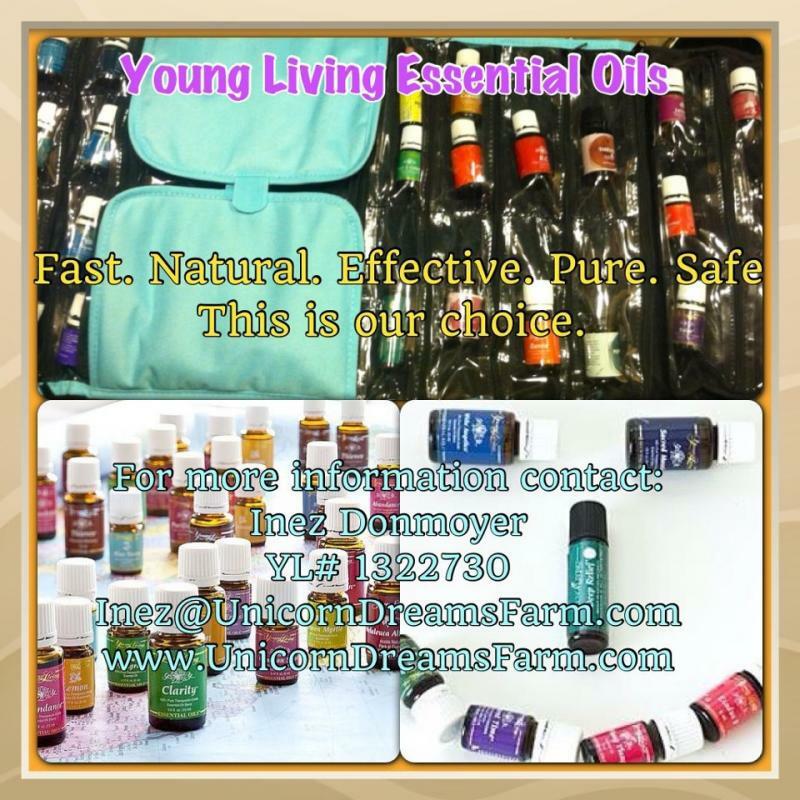 I will only use and trust Young Living Essential Oil's. The degree of quality and "seed to seal" guarantee has earned my faith in them. I can literally "smell" and feel the difference between Young Living brand and "other" common store brands. As with other types of healing modalities, it is important to understand and educate yourself in their use. Learn what properties each EO has and how best to utilize that oil. Personally, I will not use, apply, diffuse, or ingest any brand other than Young Living. This is especially important if you have cats in your home, they are particularly sensitive to chemical influence. It is of utmost importance that the EO's I use are safe as well as effective. I've witnessed the difference these oils have made, both physically as well as emotionally in whoever is being treated. If you are interested, and/or have questions please feel free to contact me. If you are not a member - please read on for important details about becoming a member. You will want to SAVE this message, or I can message it to you, for future reference. Becoming a member of Young Living (YL) is pretty straight forward. There are 2 types of memberships described below. If you decide to become a Young Living member just go to my website,www.UnicornDreamsFarm.com(links) or my Young Living website, ﻿Unicorn Dreams Young Living ﻿, and enter my member number, ﻿1322730﻿. Most people are familiar with Costco or Sam's Clubs which are the largest two membership warehouse clubs in the world. Costco is the fifth largest general retailer in the United States. Like Costco, Young Living offers different levels of membership. The level with the most benefits is called Independent Distributor. As a Distributor you will join a FANTASTIC Up/Down Line "Team." This will include a ton of educational materials, videos, information, and Facebook group. It is literally an extensive resource for information and training, communication, and support. I LOVE this team! There is always a ton of information to be shared (webinars, teleseminars, group posts, etc) and any questions answered expeditiously. We have quite a few phenomenal and knowledgeable members! Here's a brief synopsis of the 2 different membership levels. With this option, you will pay wholesale for all of your Young Living Products. Benefits include a 24% savings on all products. There is NO requirement to make a monthly purchase, but there is a one-time fee ($40.00) in order to setup the wholesale account. Please Note: Costco members have an annual fee - Young Living members have a one-time (no annual) fee. With this option, you will pay full price for all Young Living Products - up to 35% more than Distributors. Benefits include FREE sign up, and there is NO requirement to distribute products OR make a monthly purchase. You will receive email announcements of company product specials including buy one – get one free opportunities. ﻿February has a "bonus" incentive to join. That's a $40 credit added to your account! There's only 9 days left... don't you think it's time to "start living" with safe, healthy, and natural methods? ?